Summer is usually the season we set our reading goals high, because we have some time to be able to sit down and really devote our time to reading. Right? Well, if you are anything like me, we tend to get distracted and run out of time, or we just want something light, and entertaining to commit our reading time to. 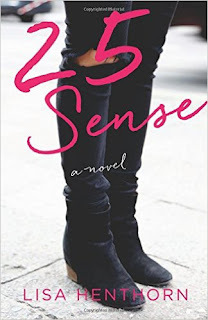 25 Sense will definitely satisfy the reading tastes of even the most distracted reader, it isn't too long, so you can easily finish it in the span of a day. Then you can pat yourself on the back, head to Twitter, and join in the #bookaday fun! So, what is a gal to do when she falls in love with her boss? I know, I know...quit, right? Well, for Claire Malone it is just not that simple. She's fallen for her boss Sean, and can't seem to pry herself from his alluring grasp. To complicate her relationship, Sean now seems to be enamored with the new starlet that has graced the set they work on. How can she hold herself together? Will she finally come to some sense, or has all hope for love been lost?